The catalyst for this website was a desire to teach myself how to design and develop website materials and to provide general information of interest to a wide audience on the subject of emergency services. This site is a vehicle for the sharing of my thoughts, ideas and passions. A caveat before you explore – this site does not intend to represent the official policy of any organization and all references on this website are provided for information purposes only. I have provided links to a number of professional and government agencies and these should be accessed if you are seeking up-to-date policy or general information. Having said that this website is a gateway for cyberspace travellers to access, share and contribute information relating to police, fire, ambulance and state emergency services. Information is mostly applicable to the Australian Emergency services arena, particularly relating to the State of Victoria and Melbourne, its capital city. 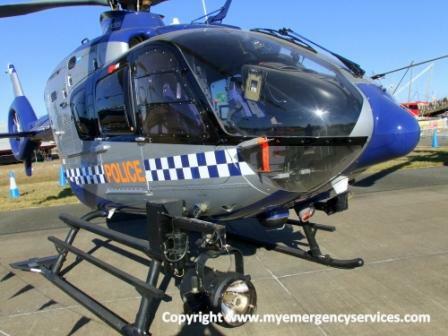 The Victoria Police EC135, based at Essendon Airport, has an eye catching grey and blue livery. build this site. As with most websites, this is a “work in progress” and I welcome your input into the development and growth of the site. I have spent 32 years serving the public and community in and around volunteer and professional emergency services, with experience in operations, planning, logistics, communications, and emergency management.